The Virginia Department of Forestry has recognized the family of Douglas D.R. Palmore as Century Forest Landowners for 120 years of ownership of their Powhatan County property. The Century Forest program was created by the General Assembly in 2016 to honor those families who have owned their forestland for 100 years or more. Since then, 44 families – including six families in 2018 – have enrolled their properties in the program. 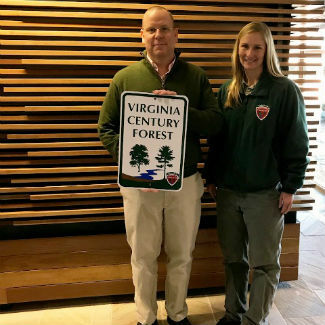 Area Forester Kathleen Ogilvy assisted the Palmore family with the application process and presented the family with a certificate from Governor Ralph Northam and a Century Forest sign to post prominently on their land. The Palmore family has been in Powhatan County since the 1700s. In 1899, Mr. Palmore’s great-grandfather acquired the initial 50 acres, which included the historic home, called Provost at the time. The family ran a general store, post office and telephone exchange at Provost through the 1950s. Over the years, the family acquired additional land, enlarging the property to more than 137 acres. The property includes approximately 100 acres of actively-managed forestland. A pine harvest was conducted in 2016 and the family has developed a plan with VDOF assistance for hardwood regeneration to increase the tree species diversity and benefit wildlife.